Mr. McKeiver is currently the Director of Musical Studies at Kestrel Heights Middle School in Durham NC. He is a graduate of Fuquay-Varina High school, and North Carolina Central University. He has studied Music Education at Methodist College, with a concentration on Euphonium and Trombone under the direction of Dr. Richard Jones. 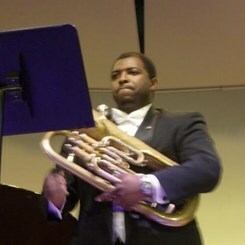 He completed his degree at North Carolina Central University where he studied euphonium under Dan Clouse and trombone under Robert Trowers and conducting under Pamela Halverson. While at North Carolina Central University he served as student conductor under Jorim Reid and Samuel Rowley.